This content was published: November 23, 2011. Phone numbers, email addresses, and other information may have changed. Portland Community College is celebrating its 50 years of serving the community and few people better exemplify that spirit than PCC board of director Jim Harper, who was honored recently with national and statewide accolades. The Northwest Portland resident, who serves as PCC board chair, won the 2011 Pacific Region Trustee Leadership Award from the Association of Community College Trustees, a national organization based in Washington, D.C., and the Oregon Community College Association’s Howard Cherry Award for Outstanding Community College Board Member, a state award. He also was named to the ACCT board at its convention in Dallas, Texas in October. 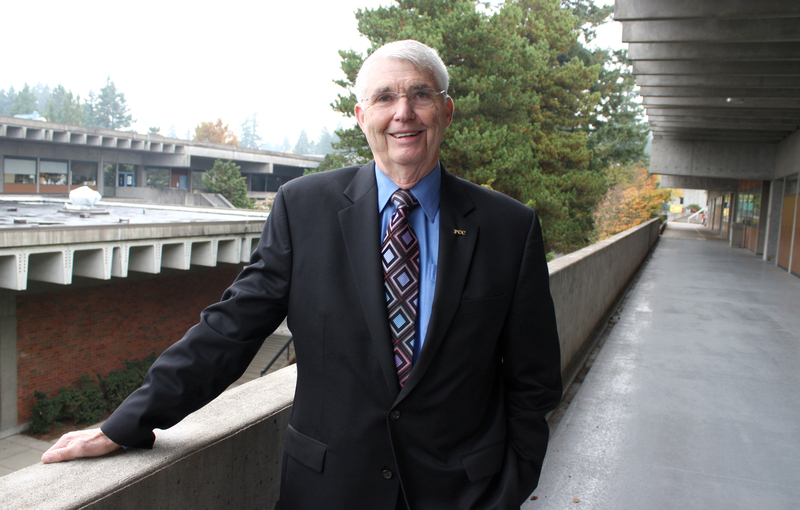 In addition to his trustee work for PCC, Harper has been on the PCC Foundation board for more than 24 years. He has helped provide guidance as the Foundation has grown substantially over the years since he joined its board in 1987. The awards recognize Harper’s more than 40 years involvement with the college as a student, volunteer, PCC Foundation and PCC board member and a corporate user of PCC services. Harper, who is a local realtor in Portland and a former director of Human Resources at Wacker Siltronic Corp and division manager for Tektronix, Inc., has been on the PCC board since 2005 when he was elected as the Zone 4 (downtown and portions of Columbia County) representative. One of his biggest accomplishments has been the Gateway to College National Network. He is one of the founding board members of the network and currently serves as secretary for this organization, which gives high school dropouts a second chance at completing their diploma and transitioning to college. It’s been replicated nationwide at more than 110 school districts. 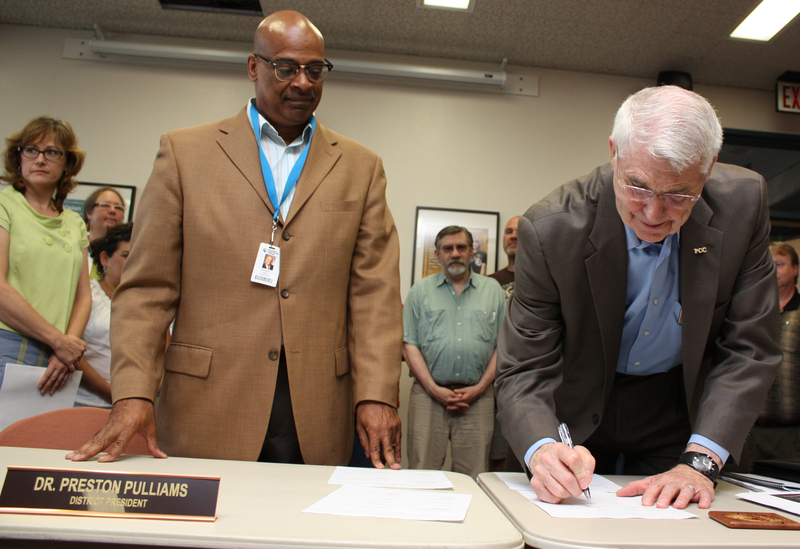 One of his first duties as board chair this year was to sign the new faculty and classified staff labor agreements with District President Preston Pulliams (left). In addition to his trustee work for PCC, Harper has been on the PCC Foundation board for more than 24 years. He has helped provide guidance as the Foundation has grown substantially over the years since he joined its board in 1987. In the initial years of serving on the PCC Foundation Board while working for Tektronix and later Wacker Siltronic, he used PCC’s workforce development program to provide his employees opportunities to take college classes or participate in onsite job-skill training. He pioneered a tuition refund program where employees were reimbursed for any college classes or training they took through PCC in an effort to promote workforce development. “I’ve been so committed to education ever since I was in grade school and my mom was a teacher for 42 years,” Harper said. “I went to school right out of the Navy and went to work at Tektronix. At that time, my son and I actually took a computer class at PCC when he was in grade school and that’s when they had ‘zeros’ and ‘dots’ and ‘on’ and ‘off’ and all that. Harper has served as a member of the Oregon Community College Association Executive Committee and eventually became OCCA President. As a past president of the OCCA, he continues to actively serve the interests of the association and he has led efforts to build strong relationships between board members statewide. In addition to serving on numerous local business and community councils, he’s helped to develop the Life by Design Northwest Program, which serves retired seniors who are looking for lifelong learning courses or after-50 life management. Jim Harper (right) is sworn in as PCC board chair by District President Preston Pulliams. 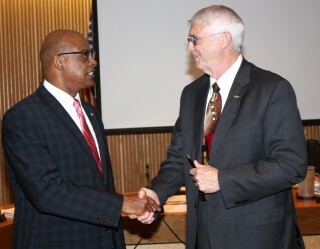 “Jim is one of our most devoted and active trustees who spends his time collaborating and connecting with his fellow trustees and promoting the community college concept to local and national audiences,” said fellow board member David Squire. The Association of Community College Trustees is a non-profit educational organization of governing boards, representing more than 6,500 elected and appointed trustees who govern over 1,200 community, technical, and junior colleges in the United States and beyond. These community professionals make decisions that affect more than 1,200 colleges and over 11 million students annually. The Oregon Community College Association represents the seventeen publicly chartered community colleges and their locally elected board members as well as the interests of the faculty, staff, administration and nearly 350,000 students in those colleges.